Trees are such selfish jerks -- without providing anything tangible in return, they're constantly demanding water, sunlight, and not to be cut down and shredded so your puggle can crap into them. Well, maybe they're right to, according to the Urban Forest Map. Billing itself as a census for trees, ridiculously ambitious UFM's a fun-to-play-with, open-sourced map of every tree in SF (at least that's the goal), which adeptly calculates the supposed value of said trees (both monetarily and otherwise), and is brought to you by a couple of forestry professionals who recognize that "tree people like to plant trees not enter data"...most likely because they also smoke them. Start by searching UFM by species and/or neighborhood (e.g., Monterey Pines near Western Addition), and further refine results with sliders for diameter n' plant date, or check-boxes for everything from "native to region" to "edible fruit/nuts" (though it's still up to you to find Deeeez). 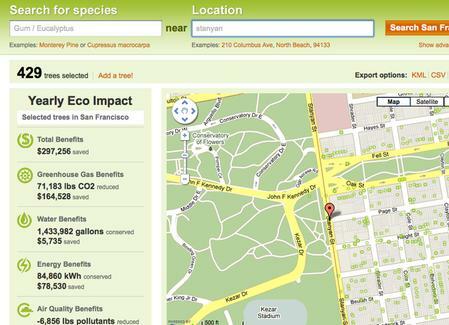 As the map changes to reflect only trees that fit your specifications, so does the map-side display of the greenhouse gasses they reduce, gallons of water they conserve, and the dollar amounts associated with those figures; in the end, it's literally possible to conclude that the New Zealand Christmas Tree at 1949 Post St. saves the city $74 a year, meaning we're only infinity more NZ Christmas Trees from closing the budget gap. If you too are a tree person, shame on you, and you can add your own trees, one by one, all the better to know just where they are, in case Buckley feels an urge.